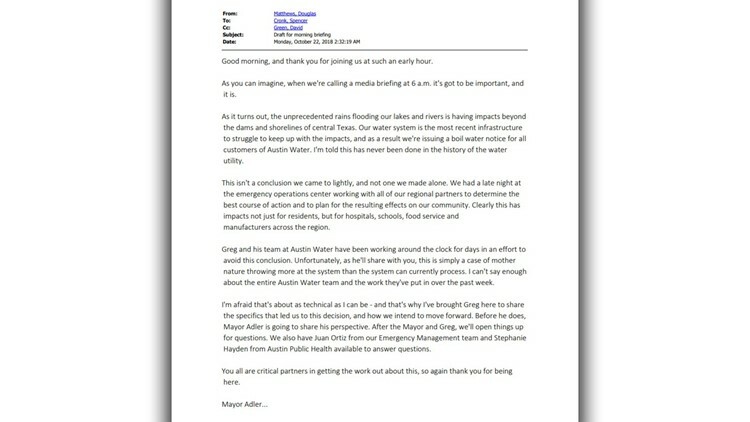 The emails that were sent between several city leaders show a scrambled and often concerned effort to manage the situation days before the Austin boil water notice began. AUSTIN — After major flooding in October clogged Austin's water treatment plants, we are now learning that city officials were scrambling to handle the city's first-ever boil water notice, according to emails obtained by KVUE. Starting Sunday morning, alerts went out to city staff that there was a lot more dirt in the water because of the floods, but it was still safe to drink. They gauge this based off something called turbidity. It's the amount of cloudiness in the water. Normal levels are at less than five units, but at that point, it was spiking above 400 units. The Director of Austin Water's email showed they were pretty worried and they couldn't tell when the system would stabilize. Then, an email went out at 2 a.m. Monday to City Manager Spencer Cronk saying they had been up all nigh tat the Emergency Operations Center trying to figure out what to do knowing this would be a problem for hospitals, schools, restaurants and businesses. But "mother nature threw more at the system than they system could handle." That started a scramble to alert everyone. Officials had to write up a press release, text alert and call a press conference for 6 a.m. in the morning. That's when Austin Water issued the boil water notice, even though emails show the water was technically still safe. By Tuesday, it wasn't safe enough to drink by TCEQ standards. That's the state agency that oversees all of our water. Another email went out saying worst case scenario, this could last up to eight days. Officials had no idea at that point when it would end. 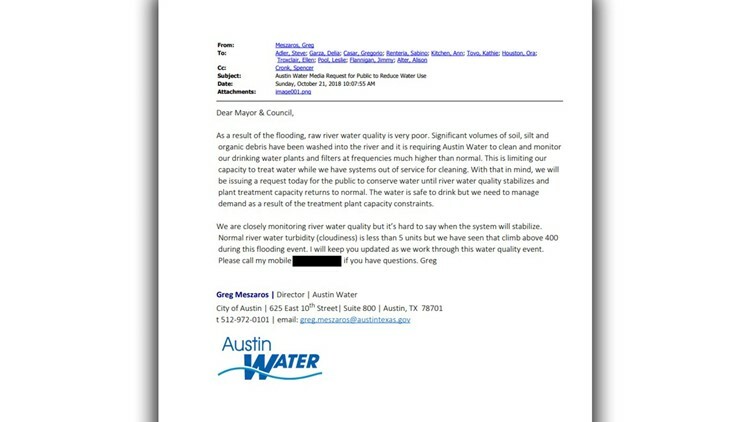 On Wednesday, the Director of Austin Water send an email to the city manager saying they had brought in "the best water chemistry PHD and engineers" they could in order to figure out how to fix the water crisis faster. He also noted that zebra mussels were not a part of the problem. Fast forward another four days and by the following Sunday -- a full seven days later -- the city finally announced the water was safe to drink again.